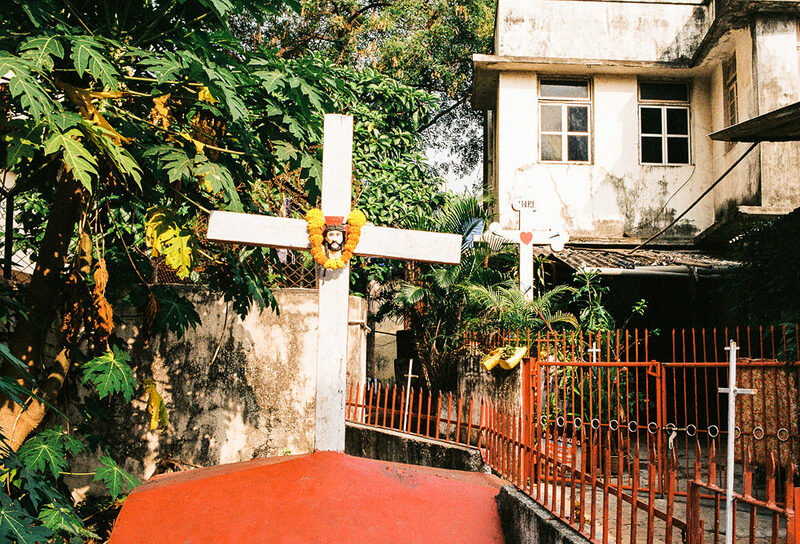 Chimbai Village starts at St. Andrew’s Church, known for its sayings on the message board. 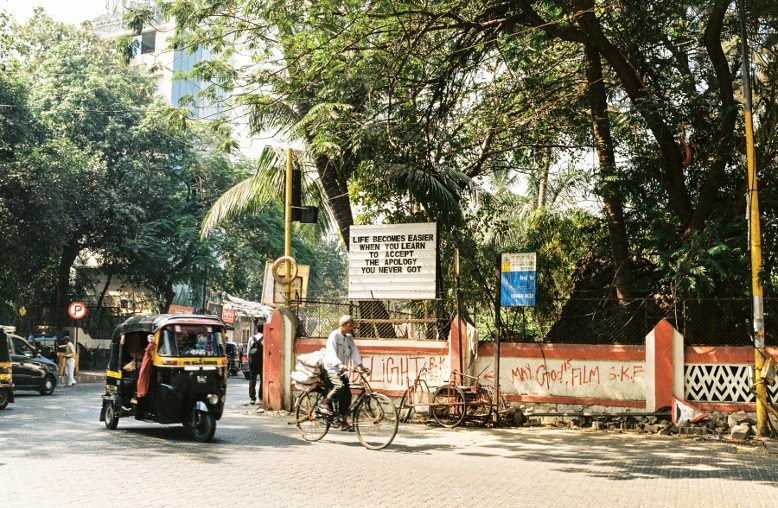 Walk along Chimbai Road today and your ears will ring with the sound of car and rickshaw horns. Vehicles force their way through the connecting road that leads from St. Andrew’s Church to Joggers Park on Carter Road. 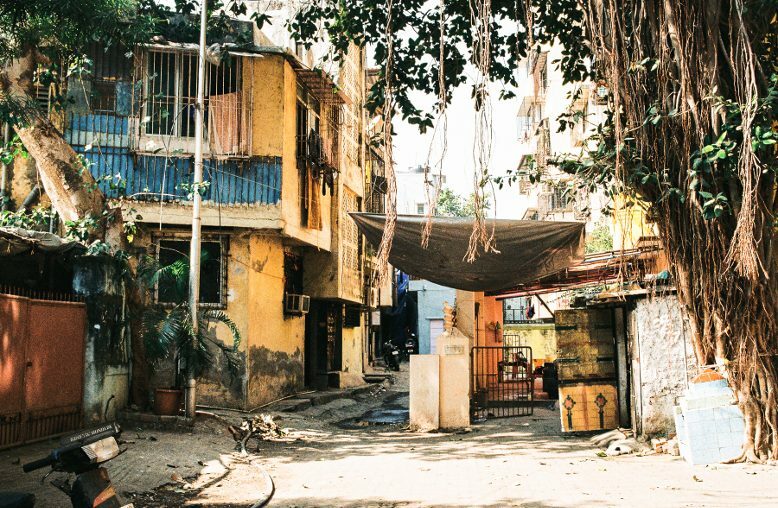 On the left of Chimbai Road, there are rows of fishing huts and bungalows, bungalows and high-rise buildings. Between them, small shops, Hotel Usha, a hairdresser, a temple, a statue of Jesus; behind the row of houses, the Arabian Sea. To the right, built cheek by jowl, simple, multi-story houses line the road. Home to fishing families, tailors and a laundry. The road is barely wide enough for cars to pass, yet it is the hub. During the day, you can encounter Koli women on the main road. Some sell fried fish. Others are sitting behind the fish, crabs and shellfish that they have spread out for sale. ‘It was very peaceful here when I was young,’ says Lina Falcon, who is 43 years old. ‘There were hardly any buildings, only a few single-story bungalows.’ But things have changed drastically. Falcon comes from one of Chimbai’s Christian fishing families. She lives in one of the houses directly by the sea. While her husband works shifts in an oilfield in the Persian Gulf, her son goes out fishing before going to school. He brings home two baskets, the contents of which she then sells the following day at the market in south Mumbai. Earlier, there used to be 70 or 80 baskets when the men set sail at 4.30 in the morning. However, fish stocks have declined. One of the reasons is rising pollution levels. The fishermen therefore have to keep going further and further out to sea. Not all of them join in now. And thanks to better school education, residents no longer have to rely solely on the sea. Yet some still come back, says Nishant Chimbaikar. The 26-year-old Koli is a member of the younger generation. Unlike their fathers and uncles, he and his cousins no longer work at sea but find employment in the hotel business, the services sector or in the creative industry. Chimbaiker and his family belong to the second religious group that lives in Chimbai. Hill Road, the location of St. Andrew’s Church, known for its message board with sayings, which is the work of Mr Mohan Roche. Chimbai is around the corner. 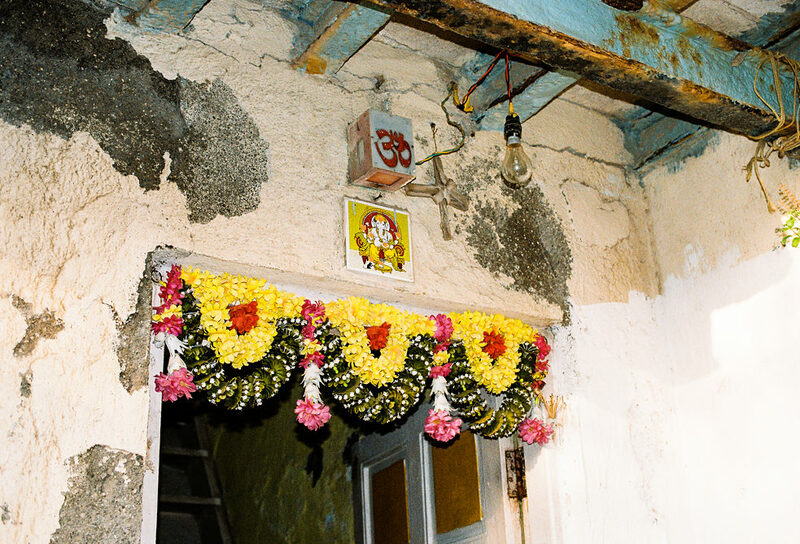 Entrance to the house of a Hindu Koli family with Ganpati, the elephant god, and the ‘om’ symbol above the threshold. 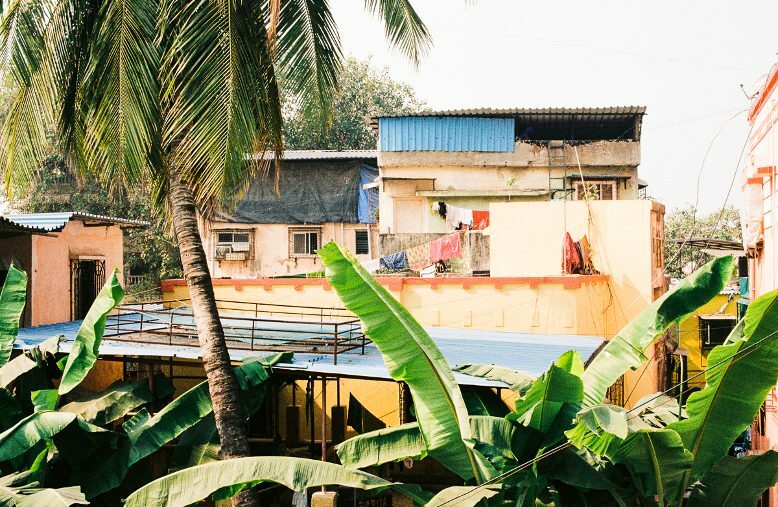 The population of the village is made up primarily of East Indian Christians and Hindu Marathi Kolis, both former fishing communities. Who lives where is obvious. 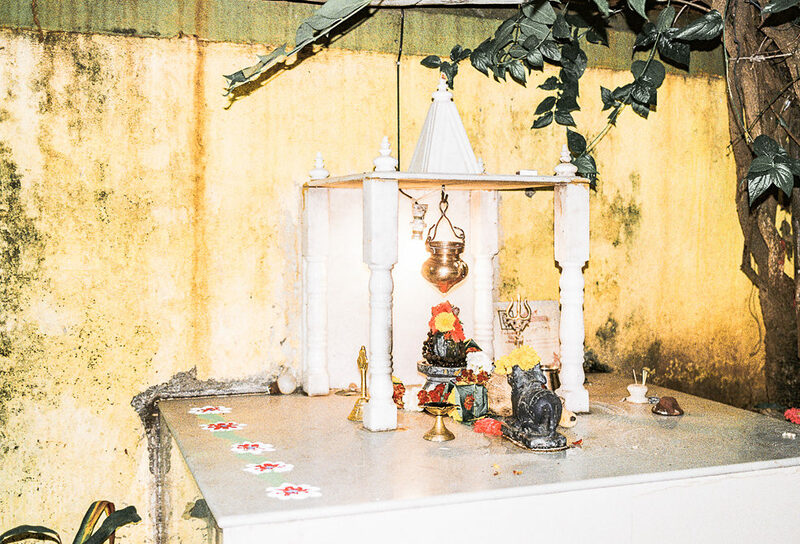 The entrances to the houses of the Hindu Koli families are decorated with Ganpati, the elephant god, and mandalas made from coloured sand or tiles with the guru Sai Baba – a revered older man in orange-coloured robes with a halo around his head. 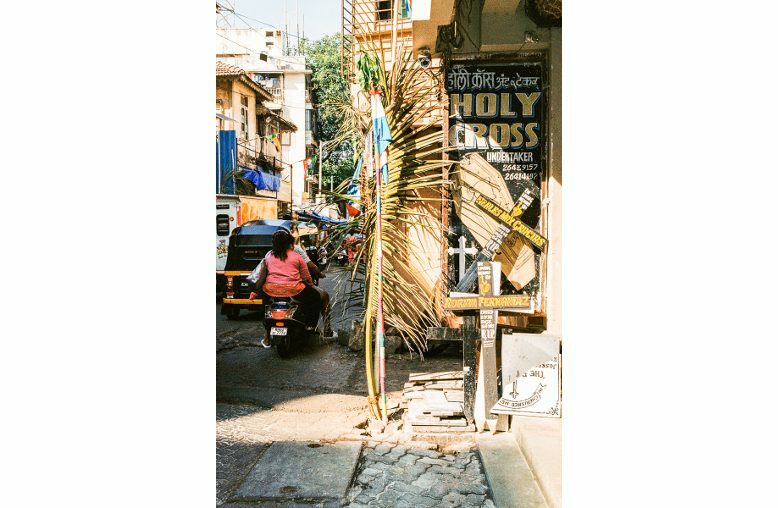 In the lanes with Christian families, one encounters statues of Jesus – usually on the cross – and of Mary, sometimes also as wall tiles. 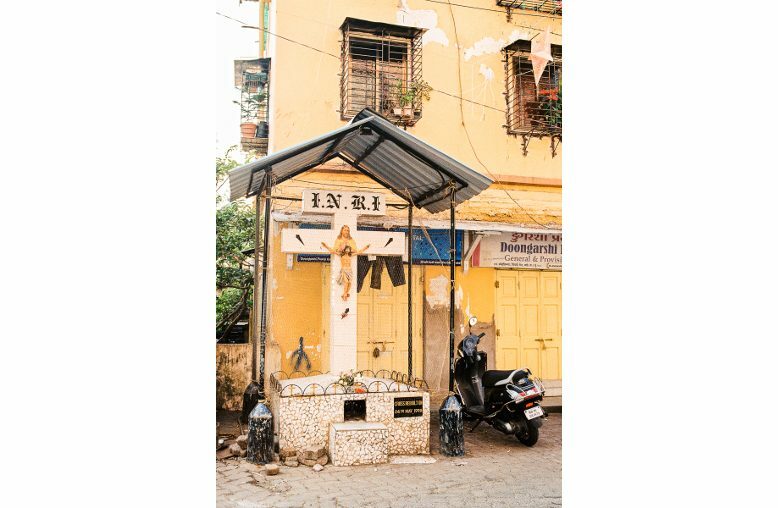 ‘Kolis are the original inhabitants of Mumbai,’ says Father Caesar De Mello, whose grandmother hails from Chimbai. 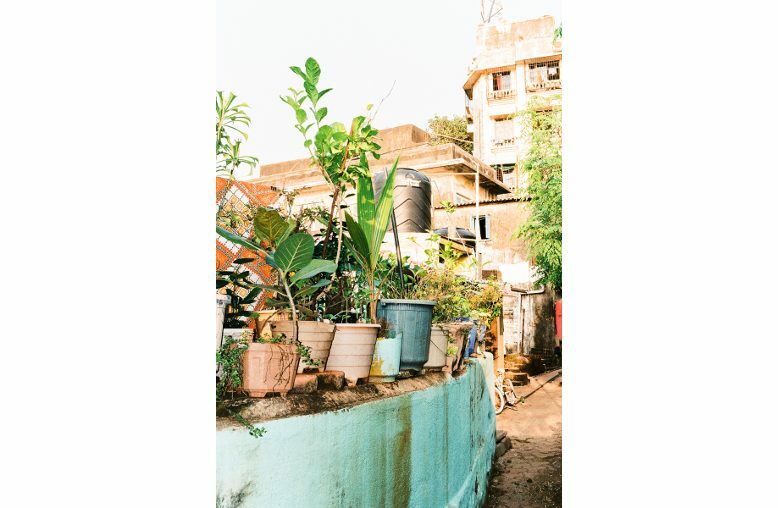 Yet she moved to the city, to benefit from Bombay’s (today Mumbai) progress, as he puts it. ‘It was primarily Catholics who lived here,’ says Ceasar, who works for the parish of St. Andrews. It was not until later that Hindus and then Muslims moved here too. This is connected to India’s colonial past. The inhabitants of Chimbai were converted in the 15th century under the Jesuit Brother Manoel Gomes. At the time, Bombay comprised seven marshy islands that were then built up into one. In 1534, the island of Salcette, where Bandra (and Chimbai) are located, came under Portuguese rule. You can read about this at St. Andrew’s. 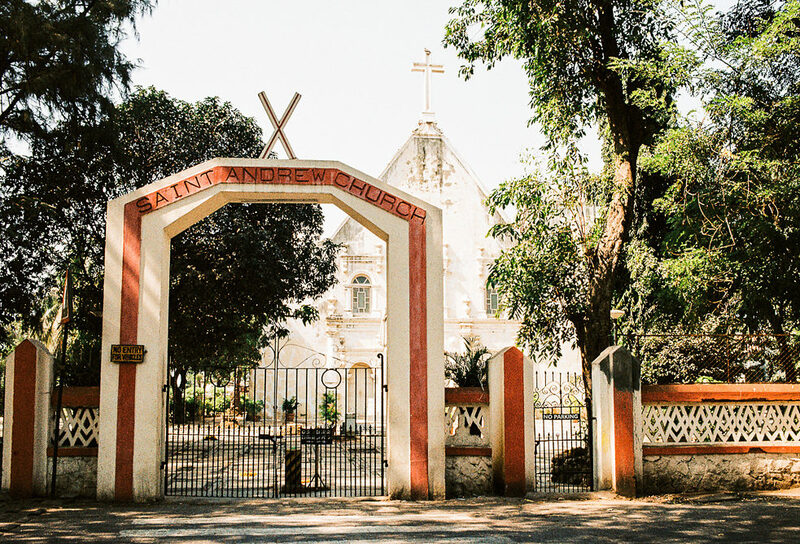 When the church was founded – between 1575 and 1616 – Bandra still consisted of 24 rural fishing and farming villages. They were separated by large cultivated areas, mango and coconut groves. The charm lingers. Even if the picturesque, unspoiled land has given way to farmed fields. It is said that Chimbai had one of the most sought-after beaches in Mumbai. A beach where one could swim, recalls Bonzo, a British-Indian who was born in a corner house in Chimbai. ‘Most of the change came 20-25 years ago,’ he says. The 85-year-old is wearing a white T-shirt with tassels, shorts and his socks come right up to his calves. 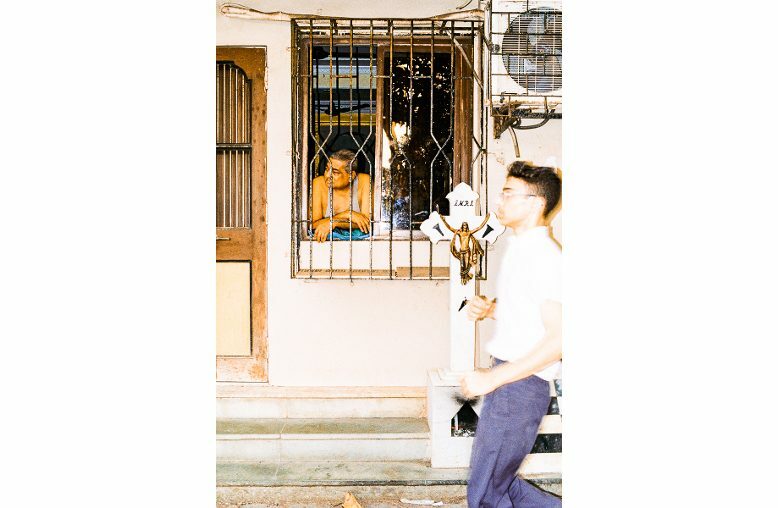 He belongs to the older generation that raves about the idyll that Chimbai once was. But Mumbai has developed into a megacity and Chimbai has not been left untouched. Ever since India’s independence from Great Britain in 1947, the population has been growing at a steady rate. With over 20 million people, the metropolitan region is one of the largest in the world. Yet it is also diverse and extreme: Rich and poor live side by side. Sometimes just a street apart. 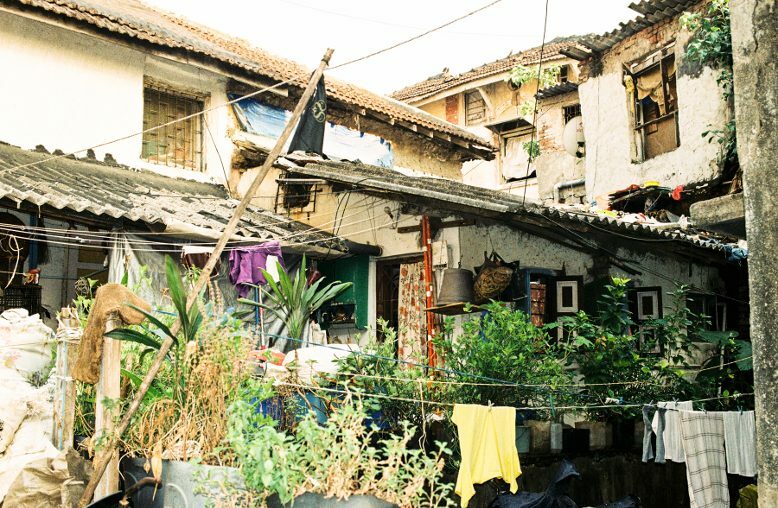 For some people, Chimbai may seem to be the antithesis of the city; the people know each other and are united by their religious identity. Even if life is changing – indeed, very fast – Chimbai is still a dreamy village with loud and bustling streets. 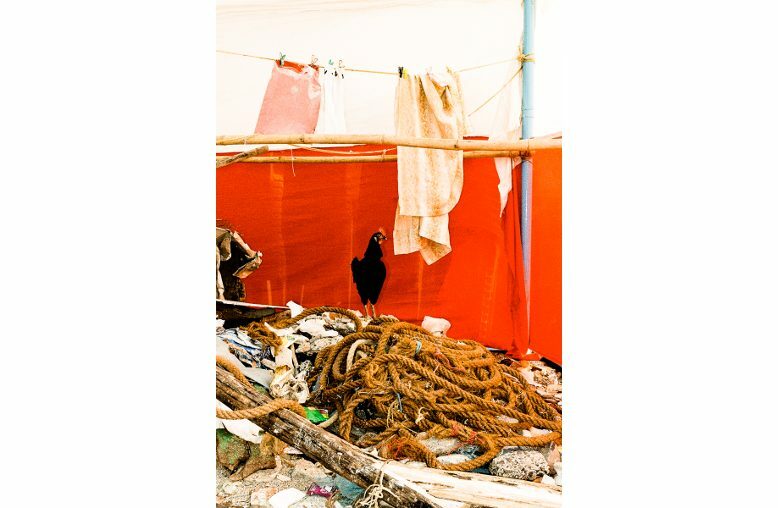 Natalie Mayroth works as a journalist and photographer and has reported in the past primarily on China and India. She focuses on social and cultural topics – from gender equality to pop culture. She graduated from LMU Munich with a Masters in European anthropology, sociology and Iranian studies. 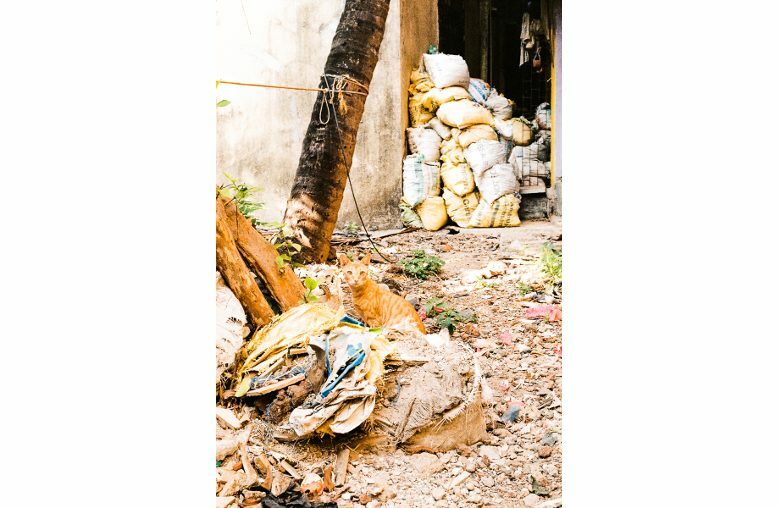 In 2017, the author lived for almost two months in Chimbai Village. 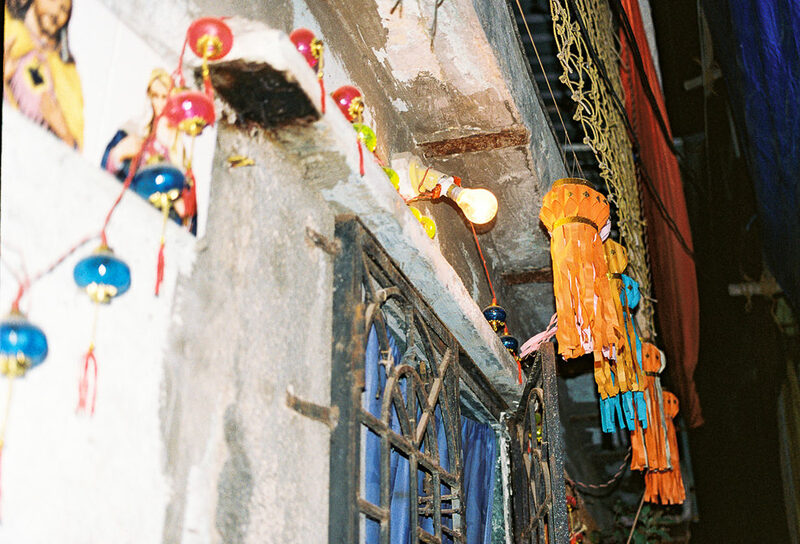 During this time, the neighbourhood and its inhabitants became her second home.